Up close and personal with a pencil urchin. And the real stars of the show. The first two pictures are the same turtle from in that cave in the middle of the reef (I just stuck my hand in and actually caught the thing, miraculously). 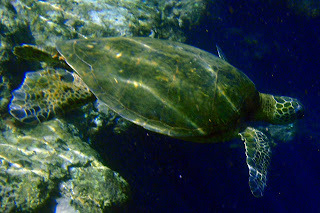 This was in the deep pool we started snorkeling in...same turtle three times.